barrels with some of the liquor before the yeast is put to it & in the same time put in the [illegible] & vent peg to when the beer [illegible] workd enough turn it & bung up your barrels immediately & not let it work out of the barrels as ale but [illegible] [illegible] not quite fill them for fear [illegible] shoud burst in a fortnight it will be fit to tap & very fine. 4 bushels makes a [illegible] of good beer to 8 dr for ale. 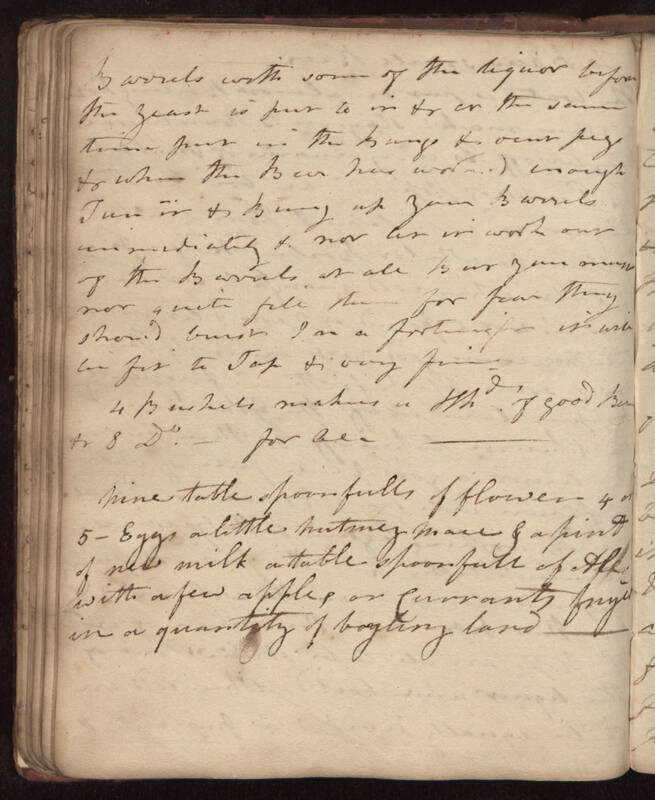 Nine table spoonfulls of flower 4 or 5 eggs a little nutmeg mace & a pint of new milk a table spoonfull of ale with a few apples or currants fryed in a quantity of boyling lard.